Yesterday it was a beautiful winter day. It was about 35 degrees with no wind with falling heavy snow. John built a MASSIVE castle. While the kids and I build a snowman. We went to the evening candle light service and Caleb was overjoyed to be able to hold his own real candle. Thanks Aunt Amy for the snowman pieces. 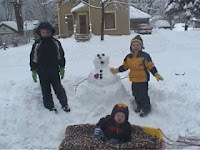 I think I have gotten a picture of the kids every year making a snowman with them. If I remember right this would be the 6th winter we have had them. Even Nathan got in on the action shoving the nose piece in.